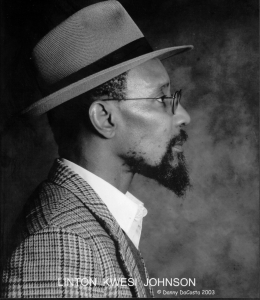 Linton Kwesi Johnson was born in 1952 in Chapelton, Clarendon, Jamaica. He came to London in 1963, went to Tulse Hill secondary school and later studied Sociology at Goldsmiths' College, University of London. He was a member of the Black Panthers, and developed his work with Rasta Love, a group of poets and drummers. In 1977 he was awarded a C Day Lewis Fellowship, becoming the writer-in-residence for Lambeth. He then worked at the Keskidee Centre, the first home of Black theatre and art. Linton Kwesi Johnson has been running his own record label, LKJ Records, since 1981. He has worked in journalism and still regularly tours around the world with the Dennis Bovell Dub Band. He is also a Trustee of the George Padmore Institute. In 2003 Johnson was bestowed with an honorary fellowship from his alma mater, Goldsmiths College.